During the flu season, the majority of respiratory illnesses are caused by organisms other than the flu (rhinoviruses, coronaviruses, parainfluenza, etc.). 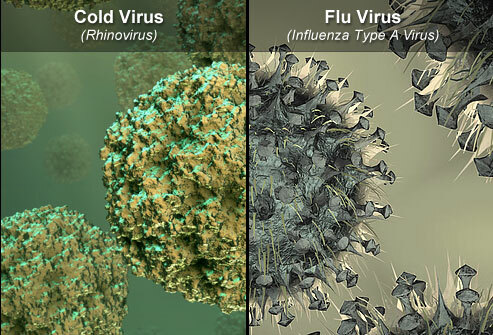 While the common cold and influenza share many clinical features, acute cold symptoms typically appear gradually over one to two days, whereas influenza symptoms (high fever, severe muscle aches, dry cough, severe headache) are typically more severe and abrupt in onset, often developing within hours. • Sore throat and sneezing occur early in the course of the infection and usually resolve in 3 - 6 days. • Low grade fever (less than 100 degrees Fahrenheit) and muscle aches commonly accompany these initial symptoms and usually resolve within a week. • Nasal congestion, sinus pressure, ear pressure are common symptoms and usually persist through the first week of illness. About 30% of patients still have these symptoms at 2 weeks, although they should be improving after 7 - 10 days. • Nasal or post-nasal drainage is usually clear and watery the first few days, but often becomes thick and discolored (green to yellow) after several days. Discolored secretions do not automatically imply that a bacterial infection is present; most improve after 5-7 days. • Cough occurs in the majority of colds and is usually more productive than seen with the flu. Sputum varies from clear to yellow-green and usually resolves within 2-3 weeks, although a lingering dry cough can persist 4 weeks in up to 25% of infections. Avoid the 'everything but the kitchen sink' multi-drug cold formulas since many contain unnecessary medications that cause unwanted side-effects. It is best to take only the medication(s) that will alleviate your predominant respiratory symptoms. Antibiotics will not hasten the resolution of acute cold symptoms. Before taking any medication, it is important to read the package label for active ingredients. Certain medications should be avoided by persons with certain medical conditions, drug allergies, or who are taking medicines that could cause unwanted drug interactions. Consult with your pharmacist or healthcare provider if you are not certain about the appropriateness of a particular medication. 1. Monitor your temperature: Fever greater than 100 degrees Fahrenheit can be a distinguishing feature of influenza, as well as an indicator for determining when to seek medical attention for complications of a respiratory infection. If you do not own a thermometer, it is recommended that you obtain one to monitor your illness. 2. Analgesics may be used to control fever, muscle aches, headache, and sore throat. These include: Acetaminophen (Tylenol), Ibuprofen (Advil), Naproxen (Naprosyn), and Aspirin. Aspirin use should be avoided in children and teenagers if influenza is suspected. 3. Decongestants* help alleviate nasal congestion, sinus pressure and ear pressure from inflamed/swollen sinus passages caused by most acute respiratory infections. Decongestants are chemically related to adrenalin and can cause side-effects that include increased pulse, jitteriness, insomnia, and loss of appetite. • Pseudoephedrine (PSE) is the most effective oral decongestant for adults. While it is a non-prescription item, illegal use to produce methamphetamine has required it to be moved behind the counter at pharmacies. Sudaphed is a brand pseudoephedrine. • Phenylephrine (PE) is a weaker, less effective decongestant available over the counter. • Oxymetazoline is a potent topical nasal decongestant that does not cause the systemic side effects seen with oral agents. Because rebound nasal congestion can occur with this agent, multi-daily use should be limited to less than or equal to 3 days, 6 if only used at night. *Persons with certain medical illness (including cardiovascular disease) or who are on certain medications (including MAO inhibitors) should consult with their healthcare provider before using decongestants or dextromethorphan. 4. Nasal Drainage: To properly clear nasal secretions, one should blow gently, one nostril at a Time. For tenacious secretions one can use nasal decongestants to decrease the blockage, and instill saline into the nasal passages to thin the mucus, making them easier to clear with gentle blowing. Blowing your nose forcefully transports air, mucus, and bacteria into the sinuses; this can worsen sinus pressure and potentially increase the risk of a secondary bacterial infection. • Water is an effective expectorant. Drink approximately 8 glasses a day. • Steam, Humidified Air, Hot Shower can help loosen secretions. • Guaifenesin: Available as a liquid or pill to help loosen nasal secretions to facilitate drainage. • Saline nasal irrigation of the nasal passages can loosen nasal secretions to facilitate drainage and relieve obstruction. • Opiod Cough Suppressants (Codeine/Hydrocodone): Rx required. • Benzonatate perles (non-narcotic peripherally acting agent): Rx required. • First Generation Antihistamines (Diphenhydramine, Chlorpheniramine, Bropheniramine) help thicken respiratory secretions when cough is due to post-nasal drainage. *Some cough suppressants cause sedation or should not be used in patients with certain medical conditions. It is important to consult with your healthcare provider and pharmacist on the advisability of taking certain agents. 7. Antihistamines are commonly found in over-the-counter cough/flu formulas and in allergy medications. The elevated histamine levels seen in allergic conditions are not present in most viral respiratory infections, so the benefits of 1st generation antihistamines are in large part due to their anti-cholinergic properties (increasing the viscosity of nasal secretions). • 1st Generation Antihistamines include Carbinoxamine, Diphenhydramine, Tripelennamine, Chlorpheniramine, Brompheniramine, and Clemastine. Benefits include: decreasing the cough when due to post-nasal drainage, decreasing sneezing, decreased runny nose in cold sufferers. They are not effective in treating nasal congestion, sinus pressure, sore throat, headache, or malaise from infections. Sedation is a common side-effect and should be used at bed time and avoided when engaged in activities that require mental alertness. • 2nd Generation Antihistamines (Loratidine, Fexofenadine, Cetirizine) lack anti-cholinergic properties and have no proven benefit in relieving cold and flu symptoms.